NASCAR driver Mike Skinner is hosting his 4th Annual Toyota Skinner Round Up for Charity this Thursday and Friday in Daytona. The two day event kicks off with a Hoe Dash Bash on Thursday at Daytona International Speedway. Then on Friday, the party heads to Spruce Creek Country Club for a charity golf tournament. Isn’t charity great? 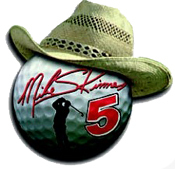 How else can you throw an event touting a hoe down and golf? In its first three years, the event has raised over $500,000 for various Volusia County charities. This year’s charities include Council on Aging, Greyhound Pets of America, Halifax Health Foundation, Second Harvest Food Bank and Concerned Citizens for Animal Welfare. Skinner usually brings along some of his friends to help out. This year, celebrities who will be participating include Nashville recording artist Stacy Mitchhart and American Idol’s Bo Bice. NASCAR stars Michael Waltrip, Ron Hornaday, Tommy Baldwin, Rick Crawford, and Steve Park will also be on hand, as will WSOP pro Tristan Wade.